This Pearl, Fancy Bali & Sterling Silver Name Bracelet is shown with 2 add-ons; Square Textured Picture Frame Charm & Emerald Birthstone Crystal Dangle. See details and more pictures below... Up to 5 string per bracelet. 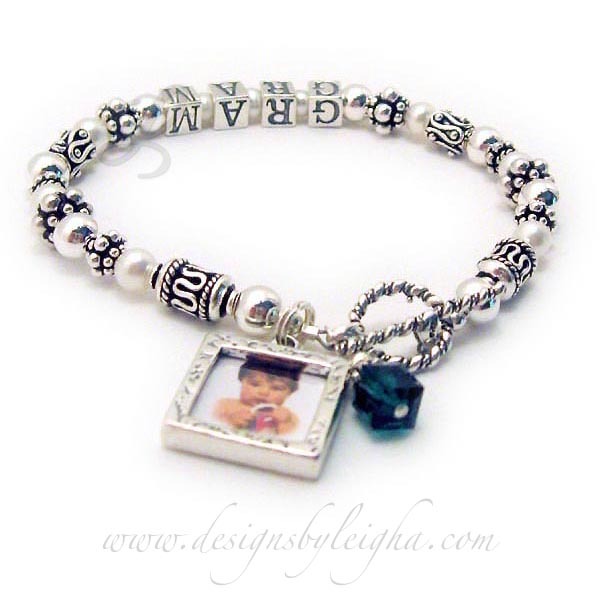 This is a 2-string / 2 name Pearl, Fancy Bali & Sterling Silver Name Bracelet with Zachary and Avery. They added 2 Birthstone Crystals for October and April and a Filigree MOM charm. They chose one of my free beautiful sterling silver lobster claw clasps. 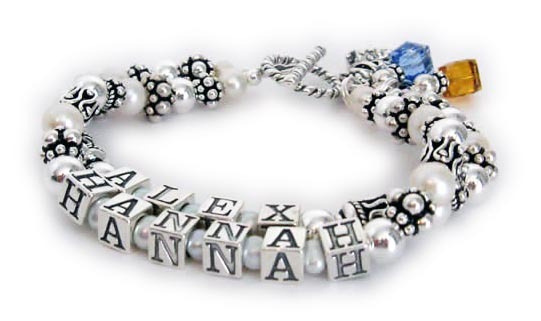 This is a 2-string / 2 name Pearl, Fancy Bali & Sterling Silver Name Bracelet with Alex and Hannah. They added 2 Birthstone Crystals for December (Blue Topaz) and November (Golden Topaz) and they added the Baby Bootie charm (it is hard to see). They chose one of my free beautiful sterling silver Twisted Toggle clasps. 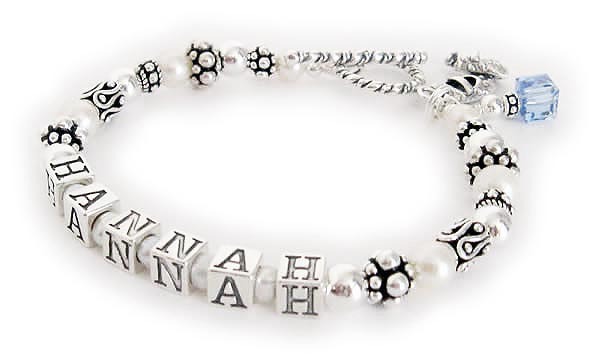 This is a 1-string / 1 name Pearl, Fancy Bali & Sterling Silver Name Bracelet with Hannah. They added a Birthstone Crystal Dangle Charm for December (Blue Topaz) and they added the Baby Bootie charm (it is hard to see). They chose one of my free beautiful sterling silver Twisted Toggle clasps. 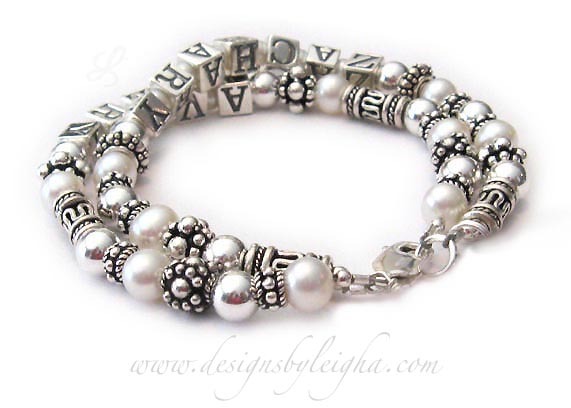 This is a 1-string / 1 name Pearl, Fancy Bali & Sterling Silver Name Bracelet with Ryleigh. They chose one of my free beautiful sterling silver Twisted Toggle clasps. This is a 1-string / 1 name Pearl, Fancy Bali & Sterling Silver Name Bracelet with Garrett. They added 3 things... a Teddy Bear charm, a Praying Boy charm, and a June Birthstone Crystal Dangle Charm. They chose one of my free beautiful sterling silver lobster claw clasps. This is a 1-string / 1 name Pearl, Fancy Bali & Sterling Silver Name Bracelet with GRAM for Grandma. They added 2 things... a Square Textured Picture Frame charm and a May or Emerald Birthstone Crystal Dangle charm by Swarovski. They chose one of my free beautiful sterling silver Twisted Toggle clasps. This Pearl Mother Bracelet is shown with CLEO and a lobster claw clasp. They added a Ruby or July Birthstone Crystal Dangle. This is a 4 string / 4 name Pearl, Fancy Bali & Sterling Silver Name Bracelet with Kaitlyn, Kyle, Krystin and Kevin - Grandma's grandkids' names. They added 5 things... a GRANDMA charm, and 4 birthstone crystal dangle charms by Swarovski (Peridot, Opal, Amethyst, and Violet. It is shown on a 4-string slide clasp. I recommend a slide clasp for bracelets with 3 or more strings but you may chose any clasp style you like. This is a 3 string with 5 names, Pearl, Fancy Bali & Sterling Silver Name Bracelet with Alexander, Sabel, London, Austin and Dallas - Grandma's grandkids' names. It is shown on one of my free sterling silver lobster claw clasps. This is a 3 string with 4 names, Pearl, Fancy Bali & Sterling Silver Name Bracelet with Daddy, Hattie, Davin and Cominick - Grandma's grandkids' names. It is shown with 4 add-ons/upgrades: Heart Picture Frame charm, Girl Bootie charm, Boy Praying charm and an upgraded Beaded Toggle Clasp.